You need to allow all the members of a group named Sales to add members to distribution groups. All servers in the organization run Exchange Server 2003 Service Pack l (SP1). Corporate security policy states that the Exchange servers cannot be managed by using Remote Desktop sessions. You plan to deploy Exchange Server 2010 SP1 servers to the network. You have a member server named Server5 that runs Windows Server 2008 SP2. You need to install the Exchange Management Console (EMC) on Server5. What should you do on Servers? Your company has one office in New York. The office is configured as an Active Directory site. All domain controllers in the forest run Windows Server 2003 Service Pack 2 (SP2). All client computers run Windows XP SP2. All servers in the organization run Exchange Server 2003 Service Pack 1 (SP1). 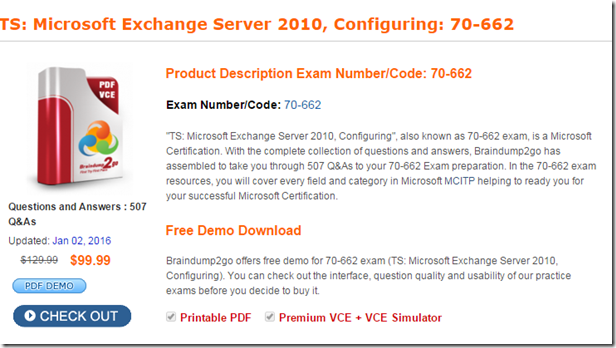 You need to ensure that you can install the first Exchange Server 2010 SP1 server. You need to ensure that you can run the Exchange Server 2010 SP1 management tools from a client computer. What should you do on the client computer? You install the Edge Transport server role on the server. You need to ensure that all email messages sent to the Internet from the Exchange Server 2003 organization are relayed through the Edge Transport server. Users report that they cannot download their offline address book (OAB). You verify that the users can successfully connect to their mailbox. You need to identify what is preventing the users from downloading the OAB. You discover that email messages take a long time to be delivered to the Internet. You also discover that there are many email messages waiting in transport queues. You need to identify how long it takes for an email message to be delivered from Server2 to Server5. Use the Test-Mailflow cmdlet to diagnose whether mail can be successfully sent from and delivered to the system mailbox on a computer that has the Mailbox server role installed. You can also use this cmdlet to verify that e-mail is sent between Mailbox servers within a defined latency threshold. This example tests message flow from the server Mailbox1 to the server Mailbox2. All of the mailboxes are stored on a mailbox database named DBI. You have a distribution group named Assistants. You have a mailbox-enabled user named Manager. You configure the members of Assistants to moderate the email messages sent to Manager. You need to prevent the email messages sent by the Assistants members to Manager from being moderated. If the members of a distro (Assistants in this case) moderate the Manager’s emails, their emails are already bypassed, because they ARE the moderators. It’s logical. There’s just nothing to set up here. They are not gonna moderate each other’s emails. Whenever they send an email to Manager, it goes directly to that mailbox, without any delay. You need to identify the 50 largest mailboxes in database 1. You enable a litigation hold for a user named Used1. You need to identify the number of email messages in litigation hold for User1.